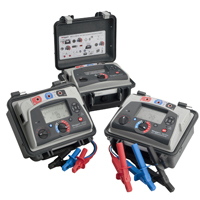 The instruments also provide enhanced productivity - they can be used from an AC source even when their internal rechargeable battery is fully discharged and they are capable of delivering dependable results even in noisy electrical environments, such as electricity substations, with noise levels up to 3 mA. The MIT515 5 kV insulation resistance tester is an entry-level 5 kV test set which offers insulation resistance (IR), timed insulation resistance (IR(t)), dielectric absorption ratio (DAR) and polarisation index (PI) test modes. The MIT525 5 kV insulation resistance tester, which is also a 5 kV unit, adds facilities for dielectric discharge (DD), step voltage (SV) and ramp diagnostic testing, as well as a large-capacity internal memory for storing time and date stamped test results, which can subsequently recalled to the display or downloaded to a PC via the instrument's electrically isolated USB interface. Real-time output of results during tests is also supported. The MIT1025 10 kV insulation resistance tester offers the same facilities as the MIT525, but is a 10 kV unit. The MIT515 and MIT525 allow tests to be carried out at five pre-defined voltages from 250 V to 5 kV, while the MIT1025 provides pre-defined test voltages from 500 V to 10 kV. All models allow an additional user-defined "lock" voltage to be set, a specific voltage range to facilitate repetitive measurements to guard against excessive test voltages being applied to sensitive equipment. Equally suitable for mains or battery operation, Megger's new IRTs incorporate a user-replaceable rechargeable li-ion battery, which is automatically recharged when the instrument is connected to a mains supply. Discharged batteries take less than 2.5 hours to fully recharge and, when fully charged, they provide up to 6 hours of testing at 5 kV and up to 4.5 hours at 10 kV. The instruments are supplied as standard with test leads and clips, and a user guide on CD-ROM. Additionally, for the MIT525 and MIT1025, a USB cable is provided together with a copy of the Megger PowerDB lite software package, which is a convenient and versatile tool for storing, analysing and reporting test results.